- a new live performance by Ursula Endlicher utilizing ULML code (=User Labor Mark-up Language) as choreography. In the performance on November 13, 2009, five performers and a few audience members assisted me in shaping the course of the show which was choreographed by live code. Using Burak Arikan's newly developed ULML-based software application which collects user activity on Facebook, the performance combined this online information as well as audience submitted ideas. The public was invited to add movement directions to an online database which were used as instructions for the performers during the show. Matching the setting of the event - a conference on digital labor - the performance was set up in an auditorium with a speaker's podium, a desk, and many rows of seating for the audience. 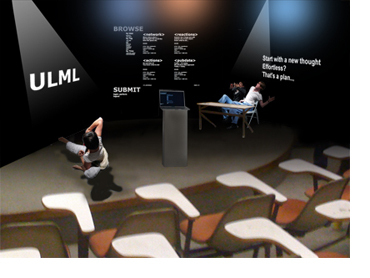 There were three projection screens showing three different versions of live code: In the center just behind the performer's desk ran the ULML-movement-library which was fed with information (describing the solo dancers movements for each ULML tag) by myself and by the audience right on stage. On the left hand side ran the code of the document Burak just accessed on facebook which had just recorded his "user behaviour" and that of his "friends". On the right hand side the descriptions of the solo-performer's movements were displayed. These descriptions were structured again by the code of the just produced entry on Facebook. When I started working with the performers, I explained the functionality of each ULML tag to them (see below). They developed movements based on this knowlegde. However, during the show, they were asked to improvise on this kowledge and interprete each ULML tag's movement free and "from scratch". The "mood" of the performance resembled a dream-like machine-driven performance-lecture: the performers animated by commands executed their tasks in their pyjamas. Being - and working - online regardless of the hour, day or night, leaves many of us wearing the same "work" clothes: the pyjama. In this performance I was interested in showing the structure of online information and how we react/live/work with it; the performers seemed to be driven by whatever the social networking/software programs told them/restrained them to do. Could our input (=the audience's choice to intervene) eventually free them from their chores...? Facebook User Labor Enactments was a collaborative event breaking down boundaries between user and consumer, performer and audience, and was driven by a continuous exchange between Web and body. ULML = beginning of the document, epic declaration. TITLE = the title of the document. USER = the person using the Website, the Web service. PUBLICATION DATE = when was the document published, what date?